Values are the things that are important to us. They are our motivators, our drivers, the passion in our hearts and the reason we do the things we do. They guide us in our behaviours and choices. When we forget our values, we lose our way. The purpose of World Values Day is to raise awareness of the importance of our values in our lives, and to encourage us to put those values into action. In today’s uncertain and often alarming world, this is something that resonates with us all. World Values Day is on 18 October 2018. The annual campaign has grown massively since the first one in 2016 and is supported by many prominent bodies such as the RSA (Royal Society for Arts), CIPD, the UK Values Alliance, PwC and Co-Operatives UK, and dozens of others from all over the world. Last year the campaign reached over 60 million people in over 100 countries, with activities ranging from big conferences and organised events to countless individual acts of kindness and humanity. The main theme this year is about values in the community, and how with even one small action we can begin to make a difference. Community is a vital for wellbeing and the Network of Wellbeing share lots of inspiring examples of projects and kindness in communities are making a real impact on people’s lives. Choose a community – it might be where you live, study or work, or a community based on faith, sport or other common interest. Or a virtual community. Choose a value that’s really important for that community. Take an action to put that value into practice in a way that makes a positive impact on the community (keep it as simple and practical as you can; involve others as much as possible). Share it. 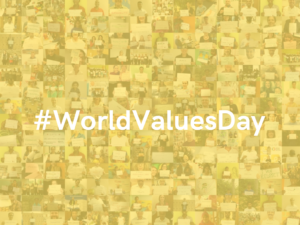 Take a selfie using the “We Value…” template and share on social media using the hashtag #WorldValuesDay. Add a fun photo, video, gif or boomerang to your post! 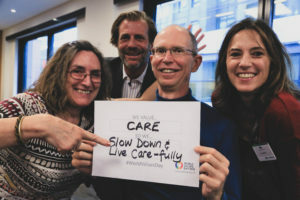 Otherwise there are plenty of tips and ideas available for those who would like some inspiration on what to do on the World Values Day website. Have a look at the Values Guides Individuals, Organisations, Community Groups and Schools. 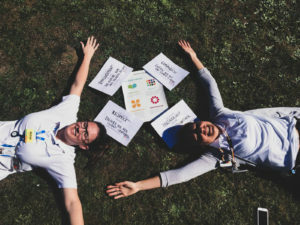 Community groups or organisations might like use the World Values Day resource pack on how to hold a Community Dialogue, or they could find out about the Values Challenge, our one hour values refresher course. You could also try a community walk as a way to share your values with others. Street Wisdom is a non-profit, global movement and supporter of World Values Day. They have offered a guide to holding your own free “Street Values” walk around World Values Day. 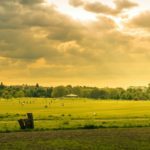 This is a community walk with a difference and an easy way of transforming an ordinary walk into an enjoyable learning experience. By simply being present, alert, and observant, we find ourselves naturally exploring and learning more about our values as we take in what’s around us in the street. 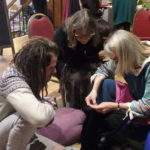 In Totnes, as part of world values day NOW will be linking up with St Johns Community Café and focusing on the value and values of good will in creating kinder safer places and public spaces. In a facilitated café style workshop called ‘What’s In It For We?’ we will be reflecting on what are the most generative questions to consider in creating a community of kindness practice? What are the different dimensions of kindness? What would a kind high street look and feel like? What can I do differently to make a difference? Can I make a small commitment to be kinder to myself, my family, my community? If you are in Totnes do join us at the Methodist Church Hall on Fore Street at 7pm on Thursday 18th October. There is something for everyone to do to bring their own most important value to life and begin to change the world, even if through a simple act of kindness. For further information visit http://worldvaluesday.com/. 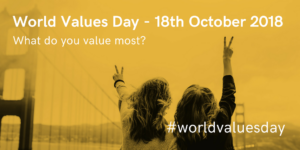 World Values Day is promoted by the UK Values Alliance whose members are individuals and organisations interested and active in the field of values, whether personal, organisational or societal. Its aim is to put values at the heart of society.